We juice almost daily in our home. Not as a form of fasting or cleansing, simply as a way to get high levels of healing and energizing vitamins, minerals, and antioxidants first thing in the morning. The most important thing about juicing is to make sure you’re using more veggies than fruits. Of course, fruit is fantastic in general. (big fruit fan, here!) When you eat fruit whole or blended into a smoothie, the fiber allows your body to process the sugars slowly. This is great. Fruit juice on the other hand- while full of vitamins and minerals- is a straight dose of fruit sugar that is high in calories and will instantly spike your blood sugar levels. Definitely, something you want to avoid. So general rule: when juicing, try to stick to a minimum 3:1 ratio of veggies to fruit. 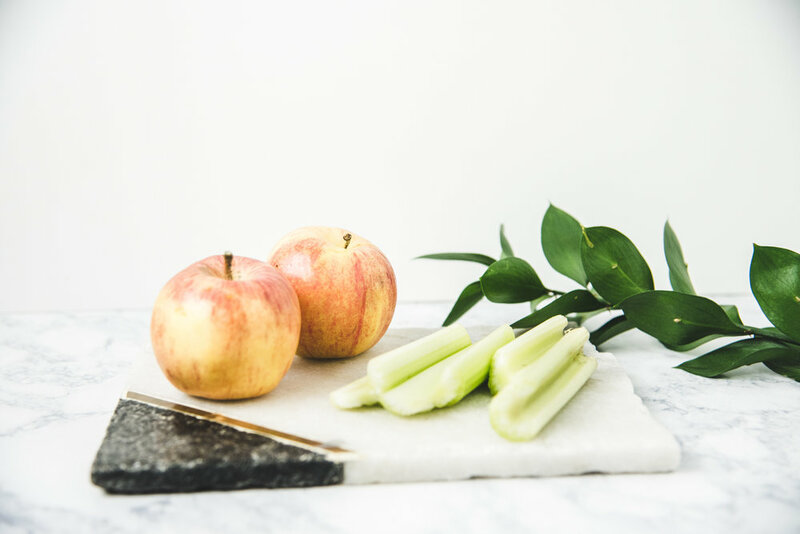 For the most part, we like to keep it simple and just use either 1 lemon or two apples in our juice recipes. And sometimes we like to get fancy with fruits like pineapple, as you’ll see below. When juicing fruits and veggies it is extra important to make sure that the fresh produce you’re using is organic. Consider this: When you juice you’re consuming a highly concentrated amount of fruits and veggies. This is the point. But if they’re conventional fruits and veggies, then you’re also consuming a highly concentrated amount of pesticides. Research has shown that pesticide exposure is linked to an increased risk of a number of devastating diseases such as neurological disorders, Parkinson’s disease, childhood leukemia, lymphoma, asthma and much more. Not only are Conventionally grown and Genetically modified foods linked to disease, but research has shown that they may be at the root of the obesity epidemic. Pesticides, specifically glyphosate (the active ingredient in the pesticide “Round-up”) are known endocrine disruptors and are proven to promote weight gain. These chemicals change the way we feel hunger by blocking the signals to our brain telling us that we are satiated, causing us to eat more. Endocrine disruptors can also increase fat cells by causing insulin resistance. This makes your pancreas produce more insulin by driving energy into fat cells, making those fat cells grow bigger and multiply. Juice with the skin on your fruits and veggies. This saves you time, and many of the key nutrients are found just under the skin, so you don’t want to lose out on those by peeling. *Except for lemons, limes, oranges, and grapefruit. It is recommended that you remove the skin of these fruits with a knife- leaving the pith (white part) intact to get the most benefits while also avoiding the bitter taste of the skin. You may think that juicing is a great way to reduce waste and use up old produce in your fridge, but it's crucial that what you're juicing is fresh. If it has bruises or discoloration, cut them out, and if you wouldn't eat it- definitely DON"T juice it! And of course, be sure to wash your fruits and veggies well before you start. Cucumber- Helps to cleanse the liver by removing accumulated waste material from the blood and gut. As a natural diuretic, cucumber also helps the body produce more urine to carry out toxins and waste. Celery- studies have shown a diet high in celery helps reduce dangerous fat buildup in the liver. Spinach- The phytonutrients in Spinach help detoxify the body and support liver function. Spinach is packed full of Vitamins A and C- which are both known to help strengthen the immune system. Cilantro –has the ability to bind to heavy metals and toxins such as arsenic, cadmium, aluminum, lead and mercury that can build up in our tissues and help to eliminate them from our bodies. A build-up of these toxins can lead to heart disease, hormonal imbalance, neurological conditions, infertility and much more. Turmeric- a powerful anti-inflammatory (has been shown to be more effective than some popular drugs in the treatment of rheumatoid arthritis.) Curcumin, the active compound that gives turmeric its superpowers, also aids in detoxifying the liver. Cucumber: Packed with vitamins, and helps manage stress; The B vitamins in cucumber have been shown to help ease feelings of anxiety. Parsley: Detoxifier, diuretic, antiseptic and anti-inflammatory agent. Parsley improves digestion, has antibacterial and antifungal properties and is a good source of Vitamin K, C, A, and Folate. Parsley also helps balance hormones and may help fight kidney stones, urinary tract infections, and gallbladder infections. Pineapple- is the richest source in the world of the digestive enzyme bromelain. Plus, juicing is the best way to get it since it’s found in highest concentration in the core, and you never really eat the core of a pinapple. But you can juice it! So be sure to ALWAYS juice the core when juicing pineapple! Bromelain is also a powerful anti-inflammatory and anti-swelling agent. So along with the anti-inflammatory powers of ginger and celery, this juice packs a huge punch when it comes to fighting inflammation. Carrots- are one of the best food sources of Vitamin A and Beta Carotene. Vitamin A is beneficial to eye, cell, and skin health. Beta Carotene benefits brain health by helping to prevent Alzheimer’s disease, improving memory, and defending against other types of cognitive decline. Get creative! Sometimes we just juice whatever we've got in the fridge- As long as it's fresh and you can stick with the minimum 3:1 veggies to fruit ratio, you really can't go wrong.